Santing's OK Tire orders custom wheels and hardware from a variety of custom automotive part manufacturers. 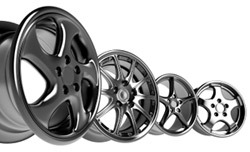 We wholesale custom wheels and hardware to local Windsor-Essex County garages that perform custom automotive services as well as selling directly to our customers. Santing's OK Tire has an extensive selection of custom wheels and accessories to choose from including locknuts, and centre caps. We also provide complete installation and computer balancing services. There are several options for ordering custom wheels and hardware from Santing's OK Tire; visiting our automotive showroom, browsing our in-store catalogue, and searching through our suppliers online catalogues on their websites. Let us assist you in finding the custom automotive part you want, we can order it for you and by doing so you will save on freight charges. If for some reason there is a warranty issue we can return the part for you, reducing freight costs/return charges. Our specialists will assist you in getting the right part for your vehicle. Santing's OK Tire will process manufacturers' warrantees for all automotive products they order and sell. Once you are decided on the custom wheels and hardware you want, please call or visit our store to have one of our friendly customer service sales representatives provide you with a personalized quote and submit your order. We appreciate your business!